A digital illustration of a young rider with his pet muskrat to be used as stock art. Created with the Wacom Cintiq 22hd and photoshop. EGG EMBRY – Thanks for agreeing to talk about your Kickstarter. Before we get into the campaign, can you share a little about what you’ve accomplished in the world of tabletop RPG through your company, Dark by Dezign? MATTHEW A. BOGDAN – Thanks to you as well, Egg. I think the best way to characterize what I have done so far is for me to have somehow become extremely resilient and overcome some things and had a little bit of prosperity in a fairly short time. This is a tough business, and I believe that you must get into the business aspect of creating Fantasy RPG Adventures for the sheer LOVE of doing it. There have been some pretty nice moments of success, and there have also been a few disappointments. You simply have to be able to bounce back immediately, and not get so down that you feel like quitting. There ARE ways to salvage your disappointments and turn them into things that have much better success. I know this, and the people I am cross interviewing know this as well. I am pretty proud of the fact that I have created eight adventures, and I am just getting started. I have so many ideas that I want to share, and I have to complete my current commitments and be patient. I just finished my 8th adventure called TOMBS OF FROSTHEIM, and it will be sent to proofing in the next 24 hours or so. But what was even more surprising for me is that I have broken out of my “lone wolf” attitude and have been INCREDIBLY fortunate to have had some great mentors and other self-publishers that have helped me out and have been doing this longer than me, and are much better known in the industry. I believe networking is one of the KEY aspects of having some success in this business. It is not really in my nature to reach out to people, but I somehow have. Probably because I KNOW how important it really is. If you go this alone 100%, you might not do nearly as well. You get help from other great creators, and you help them. It is the perfect business relationship, because it also transforms into a form of friendship due to both parties really truly loving the genre. I think it is VITAL for you to love something that you will NOT accept disappointments as being the norm. It doesn’t have to be that way. I am not saying I am driving a Porsche or living in a great new house, but it is possible for self-publishers to eventually make some form of steady income working in a field that you TRULY LOVE. There are those that know this much more than me, believe me. The key, in my opinion, is to find the ideal business model for your creations, and to stick with it and be consistent and committed to put out the best stuff you possibly can, without it taking too terribly long to do so. EGG – Your publishing experience led you to conceive of CREATE YOUR OWN FANTASY RPG ADVENTURE – RPG RESOURCES BOOKS. What’s the overview of this project? MATTHEW A. BOGDAN – The overview of this project is this. I am taking perceived problems in having a satisfying self-publishing career and asking others with more experience than me the exact same questions. I am currently sifting through the problems that (me and) others have experienced, but have somehow bounced back from – or done things in a smarter way to make more money than your first try. Not implying anyone is breaking the proverbial bank here. I am only saying that you really can get past selling 2 copies of something you thought would sell 1,000 copies of, repurposing and repackaging that disappointment, and doing much, much better on your second try. That is the wonderful thing about self-publishing. If a project dies, it’s not really dead, it’s just sleeping! EGG – Who is the primary audience for CREATE YOUR OWN FANTASY RPG ADVENTURE – RPG RESOURCES BOOKS? Small publishers? MATTHEW A. BOGDAN – The IDEAL target audience is self-publishers that have tried self-publishing, and it did not go so well. Again, you can take those disappointments and do things to do so much better. I have been there. These other seven have as well and have done some really darn good things in this industry. This is NOT for people wanting to get in with a big and already established RPG company. This is for indie self-publishers that KNOW they can do it, but they just haven’t done that just yet. It is for those that want to make their pet projects better projects and with better chances for success. EGG – What will non-publishers get out of this? MATTHEW A. BOGDAN – I believe that when you get truly DIVERSE ideas from, five to seven proven self-publishers, chances are high that you will still learn some things regarding the nature of the business. Specifically however, there is a 128-page book of traps called [drumroll, please… 😉 ] FILGAR CROOKE’S TRAPS-1. There will be a short adventure that is for D&D 5e and Pathfinder 1e in this traps book as well. Dual stat’d for both of these fine gaming systems. There are 30 traps in here for all to die, er, I mean, for all to enjoy! Also, the annoying quips of Filgar Crooke should fill you with treasure hoards full of delight! But it really is geared for indie self-publishing. EGG – James M. Ward, Lenard Lakofka, and Rick Hershey are names in the industry. How did you secure them for this project? MATTHEW A. BOGDAN – Well, I simply took a calculated, low-risk Facebook email with the first two. I had enjoyed many of their FB posts, and OBVIOUSLY the other things they have done throughout their careers, and I just said to myself, “You can’t be afraid to ask, so let it rip.” And I did. I just sent James and Lenard a Facebook email and I was very happy that they were quite alright with contributing! Rick, I knew from also reaching out over two years ago. You cannot be afraid to ask for help in this business, because you might fail miserably if you don’t. I asked him, as a supporter of his stock art and someone that liked his work, for an Indesign template that I would pay for. He made it for me, and these templates that Rick made for me are the ones I use to create my own templates. I had to change the look of it 100%, but you get the idea. Zero problems so far! It was from this that I stayed in touch with Rick and also barraged him with quite a few vital industry questions. He was always very cool, and so I thought to include a cool person that also is very talented into certain ongoing projects of mine. EGG – This includes a bundle of stock art. That’s a unique offer, what inspired it? MATTHEW A. BOGDAN – I know. 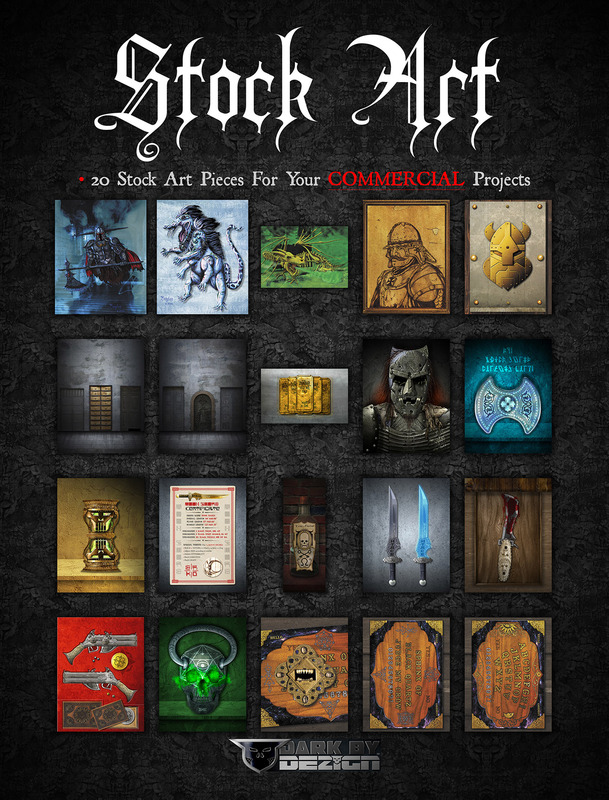 I have not seen STOCK ART bundles, but I have seen a lot of various bundles on DTRPG (DriveThruRPG). So I just was like, WHY NOT?! See what happens? The idea was inspired by DTRPG Adventure Bundles. EGG – For those that don’t know, what are templates and stock art and some of the more “industry” rewards? EGG – You’re distilling your publishing experience into 2 books, multiple templates, stock art, and more. From that, what are some of the highlights? MATTHEW A. BOGDAN – Right now, the STOCK ART aspect of things is all of my own work. 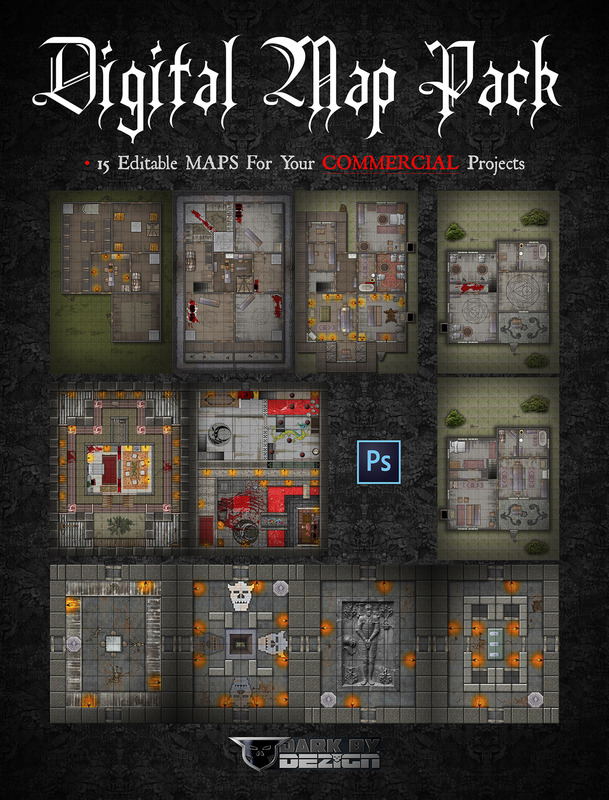 It is mostly a bunch of 12” x 18” POSTER MAPS, a bunch of 8.5” x 11” normal-sized maps that include the Photoshop files and COMMERCIAL LICENSE so you can edit it yourself and use it almost any way you want, as long as it follows the license. 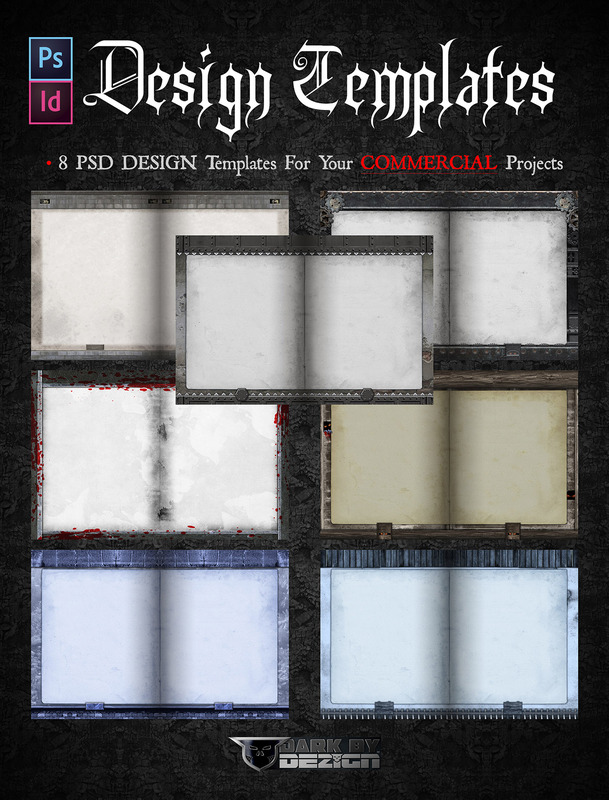 But there are also FULL PAGE INDESIGN TEMPLATES (8), MAGIC ITEMS AND EPHEMERA, and just an introductory taste of unique STOCK ART. This is for both PRINT and DIGITAL. 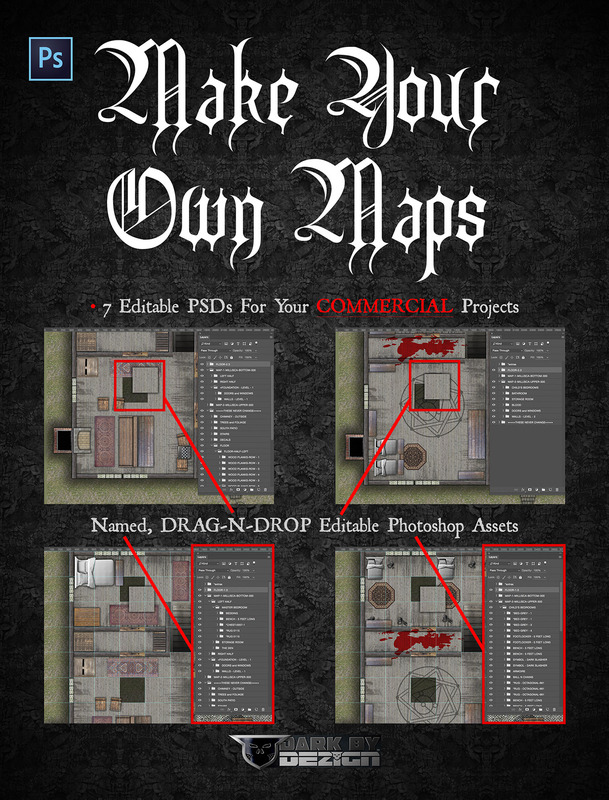 There is also a MAKE YOUR OWN MAPS module where all you need to do is drag-n-drop elements in Photoshop and use these maps for your own commercial products for your own profit. I will say this. Rick Hershey’s FAT GOBLIN GAMES has everything you could ever need. If he would be open to share some of his stock art sets, I would love to do that. To be honest, I did not think too much of it until now. I am open to ideas but only if Fat Goblin would be interested in throwing some cool stuff in. After all, HE is one of the creators I am going to learn from with the publication of this book. HE knows the best way how to do these deals. Now that you mention it, that is a GREAT IDEA! Hopefully he will reach out, despite being Uber Busy. There is still 16 days to ADD REWARDS to this current Kickstarter, ya know. Let’s do this, MR. FAT GOBLIN! EGG – Perfect, and since we’re on RPG Stock Art, let’s zoom in on RPG stock art extraordinaire, Rick Hershey (creative director for RPG Stock Art), and discuss what the Fat Goblin Games king brings to this? MATTHEW A. BOGDAN – Funny, because Rick is literally one of a handful of people that I know of that can do EVERYTHING. So, his function in this project has not been completely finalized yet. But I am narrowing things down based on what other contributors are doing. Again, if Rick would like to get together and put in a package under my current Kickstarter, I would love to hear it! EGG – For a publisher-in-the-offing, how will this product help with their first time producing a product? MATTHEW A. BOGDAN – First and foremost, it will be honest and realistic. I think anyone expecting a grand slam home run and making thousands of dollars on your first publication might very well be disappointed. I have heard (read) Rick Hershey say on Facebook, “You cannot think like a hotshot. Getting to where you want to be is not guaranteed, and it is a slow burn.” The dude knows what he is talking about. You have to have some humility and bounce back from disappointments, and BUILD. Building over time is another vital key. I do not know of any overnight success stories, but if there are, I am happy for them! You also need to build your audience over time and using a variety of ways. And there are things that these creators know how to do in order to do just that. Oh, also. I have not even started this, but after this KS runs its course, I am going to reach out to a treasure trove of ARTISTS, MAP MAKERS, WRITERS, DESIGNERS and interviewers and previewers. I will ask if they would like to be added to this humble but helpful directory. Getting new business can’t hurt, I would imagine. Also, all of the people involved in this are SOLID. They are good, non-judgmental people. It is my belief that ending up with the right people is so important, it is going to become a full chapter in the book. EGG – Thanks for talking with me here at RPGStockArt.com. For those interested in keeping up with you and backing this project, where can they find out more online? * * *About Egg Embry, Wanna-lancer™. With the advent of Kickstarter, and the resurgence in his love of role-playing, he bought a series of writing opportunities in tabletop roleplaying games in the tradition of vanity press. 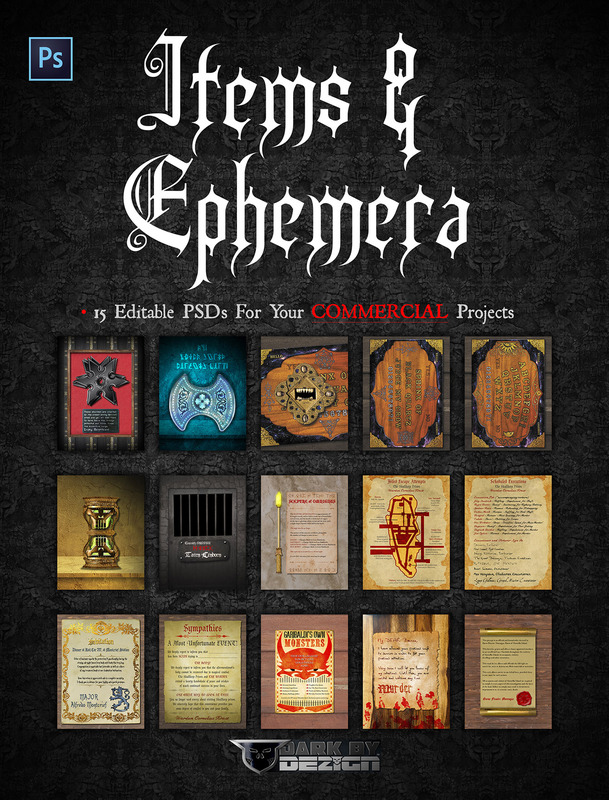 Now he freelances for Knights of the Dinner Table, ENWorld, Open Gaming Network, and the Tessera Guild, and writes for a variety of game publishers including on Dark by Dezign’s CREATE YOUR OWN FANTASY RPG ADVENTURE – RPG RESOURCES BOOKS.